We open with the joy of lunchtime in the air. Some students are happy at their meals, while some are less than impressed. We fly outdoors to see people of all ages enjoying packed lunches, while the voiceover sweetly explains that life is like lunch, in that it has different flavours and meanings. 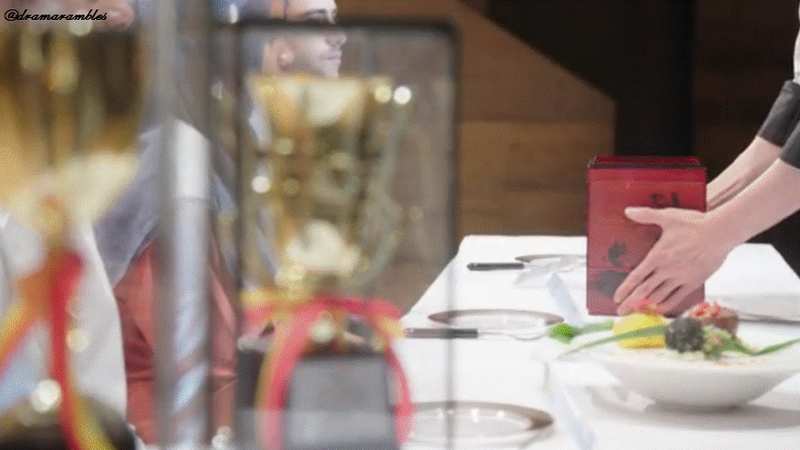 In a lunchbox making shop Park SongAh (Kim GaEun) is watching Yeo GookDae (Jung YunHo) make a lunchbox up. She is in awe and shuffles over to him when he asks if she would like to try some. SongAh opens her mouth wide and moves in for the snack he is holding. She laughs off her embarrassment when he tells her he meant the ones in front of him on the counter. SongAh tries some food and fireworks explode in her mind. GookDae asks how it tastes, to which a dazed SongAh confesses to him. Quickly she explains that it’s a taste that she likes, the flavour. GookDae smiles and tells her to sit down to wait a little longer for him to finish her lunchbox (he seems rather amused with her cuteness). Suddenly her phone begins to ring, and GookDae hands it to her as she left it on the counter. “The man I live with” that comes on the screen of the incoming call causes SongAh to get flustered and explain that it is her younger brother (I love how she stresses that it’s her biological brother to clear up any misunderstanding haha). The younger brother pleads for SongAh to pick up the lunchboxes that he has ordered (whining that he is a bodyguard not a lunchbox delivery driver). A VIP member wants lunchboxes from a specific place and she has to bring them by 1pm. SongAh finds herself at ‘FLada’, to which she scoffs at the name. GookDae materialises behind her and explains that the ‘fl’ stands for the beginning letters of ‘flower’. 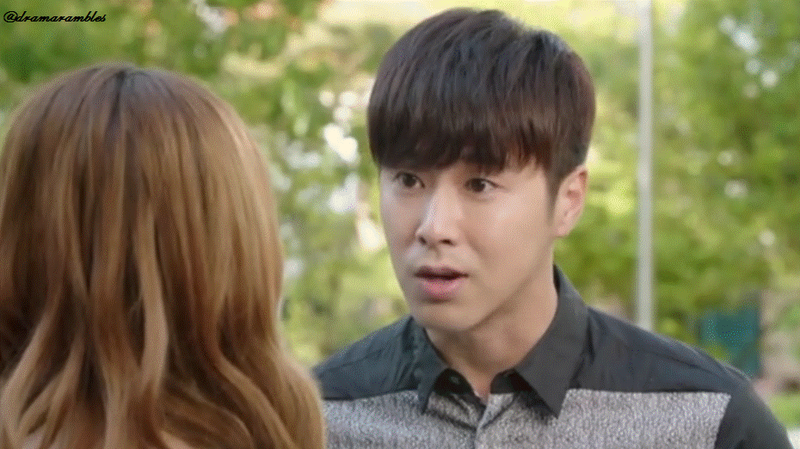 SongAh just stares at him and calls him a ‘masterpiece’ (I love the female lead so far!). SongAh follows GookDae into the shop. Han BiRyong (Baek JongWon), a member of staff asks if her name is Park Song Joo, but she announces that her name is Park Song Ah. He explains that he was asking her the name that the order is placed under. Nam SooRi (Jo YoonWoo) another employee teases her, only to get hit and told to concentrate by GookDae (even so the relationship looks good as he smiles happily at his dongsaeng). SongAh uses her time waiting to stare adoringly at GookDae. Back in the present SongAh answers her phone and her brother demands to know where she is as it’s 12:30. SongAh snaps that they are nearly done and hangs up on him. GookDae kindly explains to her that they make the lunchboxes so that they are still warm for arrival and reassures her that they won’t be late. While GookDae goes off in search of lemons, SongAh listens to SooRi and BiRyong chat about SooRi purposefully leaving his watch in a girl’s car so that he can see her again. She nods along looking impressed. SooRi tells her it’s a ‘business secret’ and not to tell, she cutely puts her finger to her lips and agrees. As they get the lunchboxes ready to put in the car SongAh notices that there is an extra one. GookDae, who has returned, says that it is for her as they had leftover food. SongAh agrees, a little dazedly, that you shouldn’t have leftover food (GookDae seems to think she is cute as he keeps smiling! Why are they all so cute? My smiling muscles hurt and it’s only been 9 minutes!). SongAh and GookDae say goodbye and he walks off. SongAh is slowly walking out of the shop, saddened at having to leave, when she suddenly remembers that she almost forgot her bag. The cogs begin to turn in her brain as she remembers what SooRi said. She hides her phone behind a pillow, grabs her bag and happily leaves. In the car, SongAh recognises BiRyong’s name on his business card, he cutely says that he only shares the name with ‘that popular cooking king’, but it helped him get closer to ‘President Yeo’. SongAh laughs that Yeo GookDae has a funny sounding name and swiftly asks why he has a lunchbox restaurant. SongAh scrunches up her face and exclaims that it’s somehow cheesy! This is what GookDae said when he won at the Cooking World Tournament, after having won for a lunchbox. SongAh disagrees and thinks that a packed lunch simply tastes the best when you dig in and enjoy it. SongAh waits outside for her brother, who runs out of his place of work. He eyes up the box that she is holding and grumbles about ‘her and free food’. 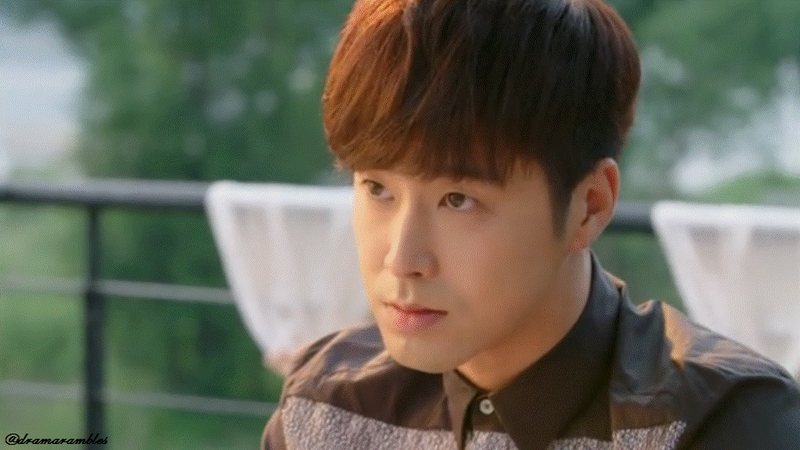 He also insults her, by telling her to put more makeup before she leaves the house (this brother is so charming…). At home, SongAh happily giggles while she repeats GookDae’s name and thinks about how he ‘memorised’ hers. SongAh opens the lunchbox and blissfully tries some food, we once again hear GookDae’s speech, but this time in Korean, rather than French. He talks about how when you open lunchboxes you fall in love and once you taste it, you fall deeper. While he says that the lunchbox is better than what you imagined, you should imagine til your heart’s content. (The wedding like music and close up to the figurines was pretty funny and cute). Just then SongAh gets a call from GookDae who tells her he is coming over and wants to know her address. Needless to say SongAh is rather dazed. Once the call is over, she rushes into her room and throws all her clothes onto her bed. A cute session of her fumbling with different outfits ensues. Now in a cute floral dress, her fashion show is rushed fashion show is over as a car horn signals GookDae’s arrival (I love how she comes tottering out in pink heels – so cute!). And the bickering begins as we see a new side to GookDae. The lunchbox with the card was not for SongAh, instead she was accidentally given a ‘proposal box’. GookDae is surprisingly a little angry at her having opened it. GookDae demands she goes to get the box and SongAh rushes to retrieve it, forgetting the most important part. GookDae is evidently on a time schedule, one because he keeps looking at his watch and secondly, when SongAh gets her dress caught in the box, instead of waiting patiently for her to unhook it, he just shoves her into his car. In the car SongAh is still trying to unhook her dress from the lunchbox, while GookDae rushes her, implying that the lunchbox is worth more than her dress when he says he will pull it off. SongAh tentatively asks how he got her number and GookDae whips out her phone. Thankfully, while he was panicking about the lunchbox, her phone rang and he got her number of her brother who was calling to moan at her. Due to GookDae’s sudden break SongAh dress rips free of the lunchbox, suffice to say she is not happy. GookDae looks sheepishly at the rip, tells her they will talk later and runs out of the car, holding the lunchbox. He sets the lunchbox down on table which has been set up outside, but is stressed to find no card inside. She proposes that he just write it down again as she memorised the contents of the card. GookDae is satisfied and they sit down to do just that. While GookDae waits for her, SongAh says that he has long fingers, which he begins to write down (Ha! I love she has practically no filter). GookDae grumbles, but SongAh quickly starts again. While she relates the contents of the card, it sounds heartfelt and the way she looks at him is genuine. GookDae stops writing and they stare at each other, the scenery beautiful behind them. From that ending scene after the preview and credits, did GookDae give her the wrong box on purpose?! 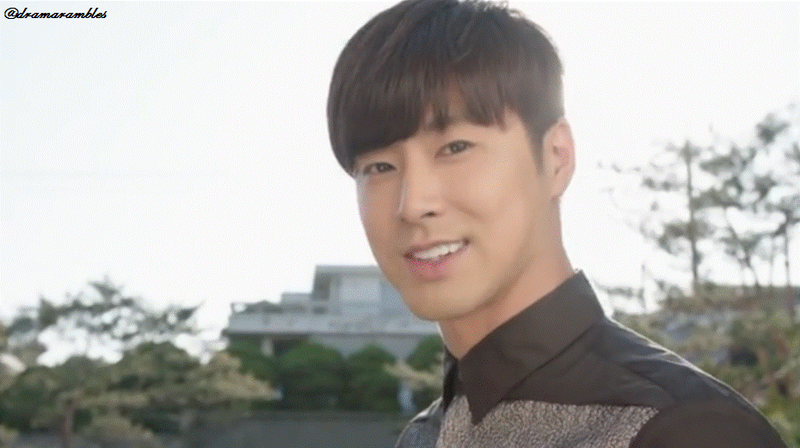 He is the one that told SooRi the tactic of leaving something at someone’s house so that you can see them again. Although I’m not sure about his personality yet. Is this grumpier side the age-old – if he’s mean to you it means he likes you? The side characters at the restaurant seem very cute and friendly. I hope there isn’t any unnecessary love triangle involving these guys and SongAh. I quite like all the acting I have seen so far and the transitions are very nicely done, as well as the effects that are used. Overall the production is very pleasing for this episode and hopefully continues on.